This is the moment a giant hay bale load erupted in flames turning an entire lorry into a moving fireball and sending burning hay flying throughout a quiet suburb. The heart-stopping clip shows the hay bales start to smoulder and then lumps of the flaming straw drop into the road before bursting into a raging inferno that the driver was ‘lucky to escape’. Professional driver John Coleman, from Leighton Buzzard, captured the chaos unfold as he drove in Everton, on Thursday last week at around 3pm. John, 48, said: “I could smell burning as I was travelling down the road but I couldn’t tell where it was coming from at first – it smelled like a bonfire. “There were about ten cars between me and the trailer but people started to slowly overtake and get out of the way – that’s when I spotted the flames and the smell got stronger. “As I was growing up I saw fires when they burned the fields – but I’ve never seen anything that big before. The footage shows a silver car and a tractor travelling behind the smouldering trailer, before the silver car overtakes. John commentates on the clip, saying: “I don’t know if he knows but that load of straw is on fire, yep it’s on fire – flames at the front. 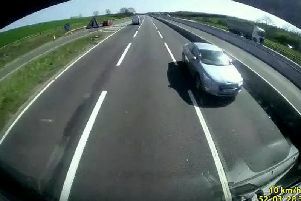 The footage then shows the tractor appearing to overtake while blasting his horn in a desperate bid to alert the driver. John said that cars travelling in the opposite direction could be seen slowing down, beeping their horns and frantically waving at the driver, however he was none-the-wiser and continued driving. John said: “The driver was in his own little world, it was only when the tractor carried on blowing his horn and the ratchet straps burned away and the load landed in the road that he spotted it. Once the driver realises his load is ablaze he pulls over at the junction of Warden Hill and Sandy Road and leaps out of the driver’s seat to assess the situation. The tractor driver also pulls over and jumps out of the vehicle and within seconds the trailer is engulfed in flames. John reversed the flatbed Hiab crane lorry away from the scene at the same time as the tractor and captured the pyre burning and sending plumes of black smoke into the air. A Bedfordshire Fire and Rescue Service spokesman said the brigade was called at 3.03pm and firefighters from Potton and Gamlingay (from Cambridgeshire Fire and Rescue Service) were on the scene at 3.14pm and were supported by the water carrier from Kempston. Crews fought the fire with three water jets and a hose reel using the farmer’s fork-lift to help break up and disperse the hay. The blaze was finally extinguished at 5.25pm.